Sprinkle cut sides of lobsters with 1/2 teaspoon salt and 1/4 teaspoon black pepper. Sprinkle snapper pieces with remaining 1 teaspoon salt and remaining 1/4 teaspoon black pepper. Heat 1 tablespoon oil in Dutch oven over medium. Add 2 lobster halves, cut sides down, making sure claws are in with bottom of Dutch oven. Cook until meat is lightly browned, about 2 minutes. Flip and cook until claws are bright red, 1 to 3 minutes. Remove from Dutch oven. Add 1 tablespoon oil to Dutch oven, and repeat with remaining 2 lobster halves. Remove from Dutch oven. Add remaining 1 tablespoon oil to Dutch oven. Place snapper pieces in Dutch oven, skin sides down. Top with lobster halves, shell sides down. Add clams and mussels. Pour tomato mixture over seafood. Bring to a simmer over medium. 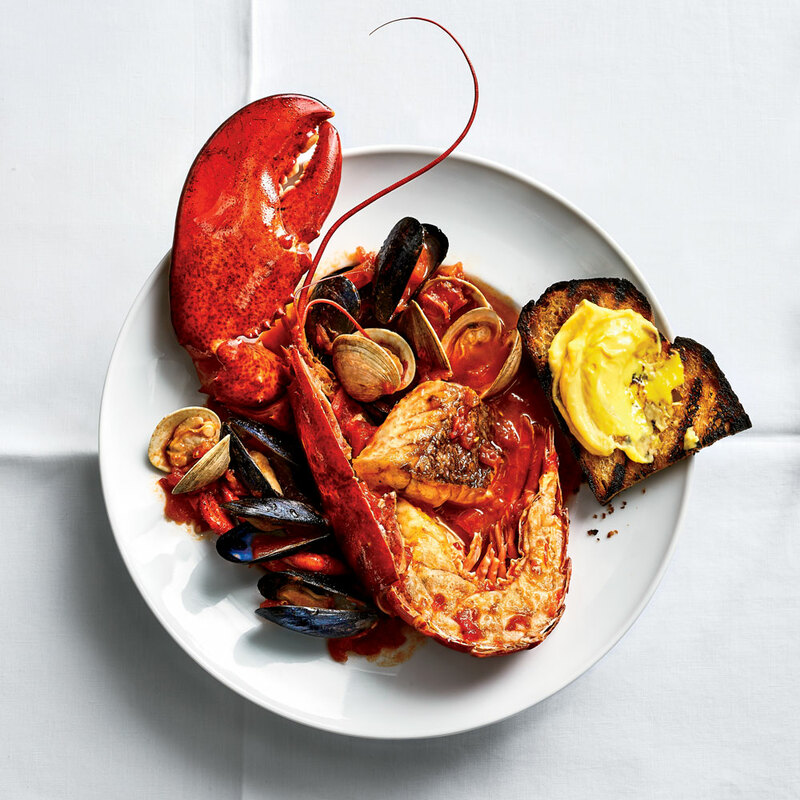 Reduce heat to medium-low, cover, and cook until clams and mussels open and lobster claws are cooked through, 10 to 12 minutes. Discard any clams and mussels that do not open.